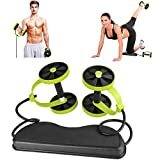 Home Exercise Equipment Core Double Wheels Ab Roller Pull Rope Abdominal Waist Slimming Trainer Works every major upper body muscle group and your abdomen Strengthens abs, shoulders, arms, back,waist, leg and so on. Two easy-grip handles. 6-speed power strength resistance pull rope, 40 kinds of fitness action, at home, office, outdoors can be used. Super elastic and strong pull rope. Suitable for women and men, shape a perfect body with it. Spending about 10 minutes on exercises every day , Core Double Wheels Ab Roller Pull Rope Exercise Equipment are a versatile, highly effective and inexpensive way to get in shape. Coming with a user manual with detailed fitness action pictures, easy to use. Products sold by the DAS Leben brand are original, No other sellers are authorized for selling our Knee Braces. Our DAS Leben team are working on providing you with the most comfortable sports item with reasonable price.